I stood in my kitchen, staring into the fridge, wondering what to do for dinner. I saw chicken breasts and thought of things I could do with it that were different from my usual fare. After a quick browse around the pantry, I decided to make my own Cashew Chicken. In a large plastic Ziploc bag, combine the chopped chicken, flour, salt and red pepper flakes. Shake the bag to cover the chicken in flour. Heat the oil in a wok and cook the chicken until crispy and browned. Remove the chicken. Stir fry the vegetables in water until soft. 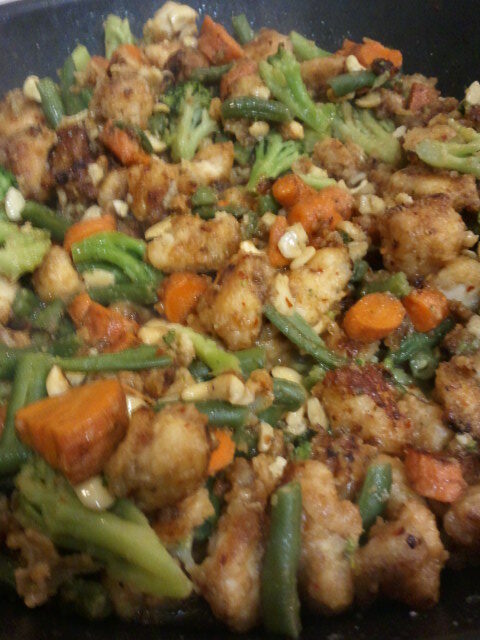 Add the cashews and chicken. Add a bit more water and let the liquid boil off.